So this is like a CRX. You buy the car, throw the engine away, and transplant something into it that actually works. Thanks Toyota, hell of a way to market a product. I'm so glad Tsuchiya left D1 to form a new league. All these crazy engine swaps and 1000+ HP cars are ruining D1GP and Formula D. It would be so much cooler if it was running the 2.0 Boxer engine it comes with. This just kills it. @ Abdul I would agree. I never had faith in Formula D just because of how its set up, just a few turns competing for the smokiest, best angled outcome and thats it. No suprise its turned in to a horsepower war. I'd love a stock engine series with longer courses. Unfortunately not many (American) tracks like having tire marks everywhere on their pristine asphalt. Working at Watkins Glen, they haaaated victory burnouts because someone has to clean that sh*t up! Having said that, like I mentioned in the BRZ post I predict a larger number of serious car people would rather spend less money on a swap then having to buy or trying to market a new aftermarket of beefier pistons, rods and transmissions. I don't care how well balanced the engine is. Mark my words there will be money to be made on motor/trans mounts for STi ...and likely GM V8 engines. I'll take mine in a 1/2UZ FE, please. LOL. I wonder what all of the people commenting in the possible BRZ STi post are thinking about this with a V8. It sort of makes me made how no one is even trying and seeing the kind of power that can be extracted from the 4U-GSE. Everyone is doing ej25 swaps. Or even this. Alas, i like the idea of a toyota v-8 powering this thing instead of some LS series pushrod B.S. I would like to know more about this car. Considering I didn't think they were going to be able to cram a V8 below the hood line of the 86. Oh hahahahhaa I just laughed out loud at my desk when I read "v8 powered toyota 86" - I'm a big fan of v8 swaps and there have to be a ton of haters on their way to this post pretty soon. Great project car and it has to be a hoot on course. Would love to see some more pics and info! @ Seriously: The flat four this car normally comes with is fine for street driving, this car is for the increasingly ridiculous world of competitive drifting where anything with less than 6 cylinders and the nuts boosted off of it seems to be irrelevant. Check the engine note on this! 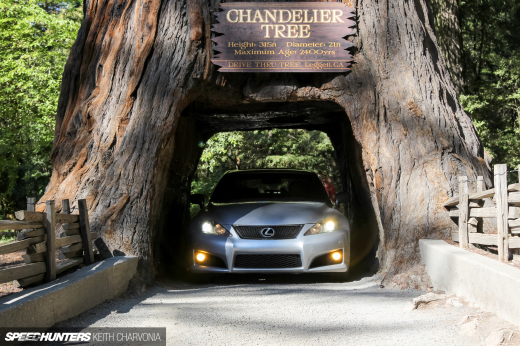 http://youtu.be/6f9xI2kI5ro Lexus V8 is A OK with me! 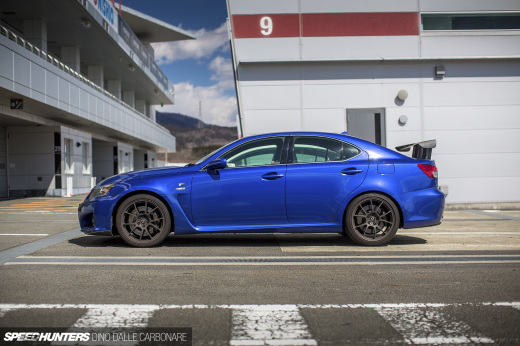 2UR-GSE is an engine from the lexus IS-F. powerfull but the wieght of it will make the car just like your good old day american car. You guys gotta remember that this is a new car Im pretty sure aftermarket parts are just in the makings for this car unless TRD already got some stuff. i knew that engine had to be good in something! Not this rice again...not the car, I'm talking about the stupid swap and mainstream drifting. I just love how people throw around words without really knowing that they mean. Ok, so it was so marvelous they put the engine into trash bin and swapped it to 5L V8? 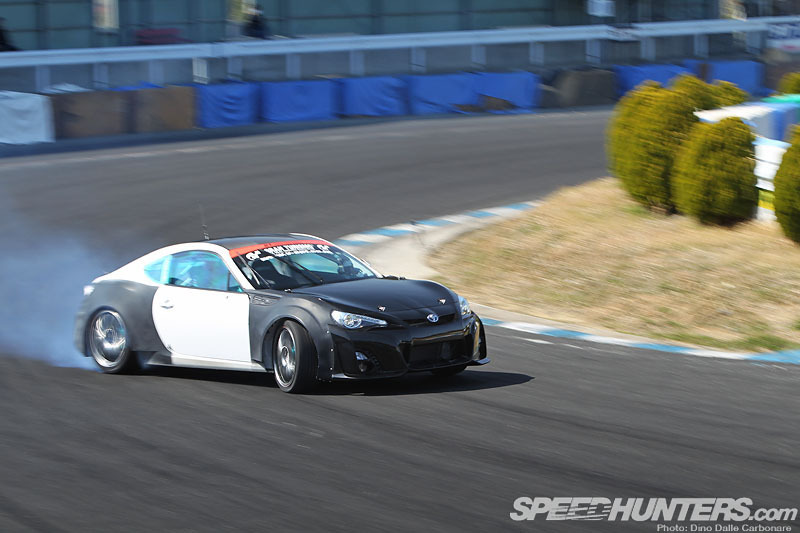 Yeah a trully cheap drift car as someone thought..
Well, even if you find it dumb, you HAVE to swap the engine in the FT86 to fight the big HP monsters that compete in D1. The HP range goes from 600 to 1000+HP ! You can't do sh*t with a 2l boxer engine that just comes out. R&D would be too expensive and would take too much time. If you find this ridiculous, just stuck with grassroot events or Drift Muscle. Speaking of it, will we see more of Drift Muscle this year on Speedhunters ? 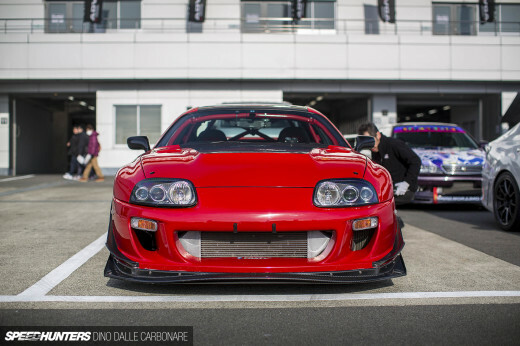 I like that the front bumper totally resembles an IS-F front bumper. Homage to the car the engine originally came in? @seriously. Yeah, it'll be real profitable with that motor in it at USD25000 or whatever it is. I suppose Toyota should just give people the car for free. "v8s are ruining drifting period.. how is turbo lag supposed to compete with the deliberate brake checking of these high horsepowered cars.. this is killing the sport and giving it no chance to progress"
Haha, so drifting is evolving away from its original state, and you're complaining that doing so is preventing progress? Perhaps the one eyed point of view that laggy turbo cars are supposed to dominate, is what prevents progress. If fitting a V8 is within the rules and does a better job, then it deserves to win (assuming that it does). Also, had a laugh at some comments saying "Why are they(toyota?) marketing the car in this way" etc, these are private companies modifiying a car they bought, to suit a motorsport application. they are allowed to do whatever they want, withhout any implied affiliation with Toyota. You know, i am into engine swaps. Have nothing against it. But it really is funny, that the engine is so crap, they couldn't find any use for it. Btw, i would do same with the boxer engine. Why to go through troubles when there're plenty engines with better performance. They would win if selling this car without engine for a lowered price..